This apparently simple manoeuvre can waste your entry money in 30 seconds or less. In part two of this series, I share three simple tips to improve your chances of success. When you are asked to perform a straight out and back, before you run off to the nearest fence and back again, stop and think for a second. Ask yourself, which is the longest part of the ring available to you from where you are standing? Unless the judge specifically designates a spot for you to run to (like a post, tree or sign) always use the most distance available to you. Remember, as long as you run straight out and back, often the direction you take is up to you, so it’s in your and your dog’s interest to use as much of the ring as possible. Why? Because it gives the judge up to ten extra paces to view your dogs movement over the competition. When you take off, remember it’s not a race. The one that gets to the fence and back again the fastest isn’t necessarily going to be the winner. On the contrary, if you want to win the prize, you should be taking your time to show your dog to the judge to maximum effect. When your dog is going away from the judge or returning straight on, there isn’t the same illusion of speed as there is side on. To ensure your dog can gait as true as it is structurally capable of, start off by slowly building your speed step by step until you have reached your dog’s optimum gaiting speed. When you have covered approximately two thirds of the distance outwards, warn your dog that you are soon going to turn and so your dog will see which way you want them to turn. Your dog’s position should dictate whether you turn left or turn right. For example, if, after you have signaled to your dog that you intend to turn, your dog is behind or level with you (in other words your dog can see you), then you should turn to the left. Alternatively, if your dog is in front of you or isn’t looking at you, turn right. This enables you to reclaim your dog’s attention and puts you firmly back in the position of leader. 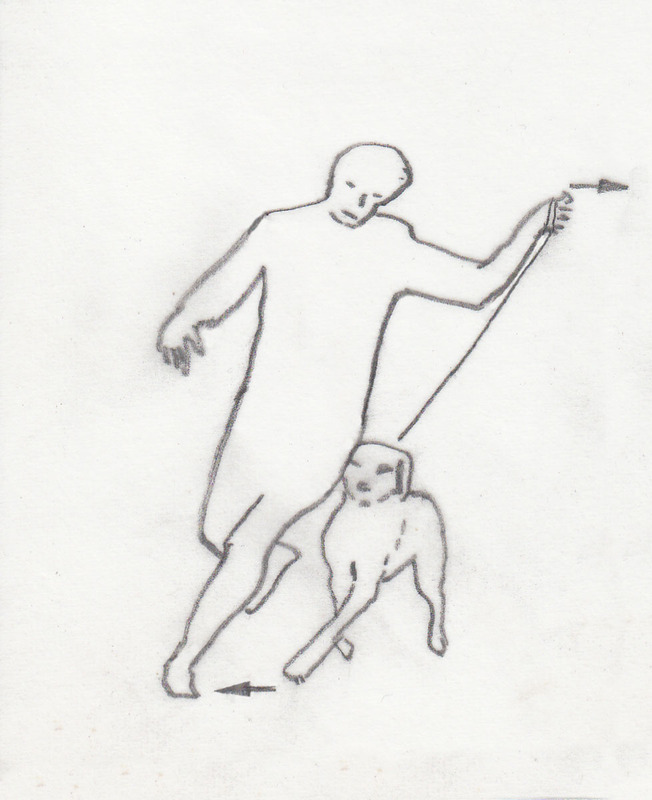 When performing a straight out back, do not try to ‘steer’ your dog with the lead (See top illustration). The lead is simply an aid and not a joystick to direct your dog. If your dog pulls out sideways away from you, never try to pull the dog back towards you with the lead. Instead, use a combination of your three aids to signal to your dog how you want them to correct the problem (I’ll be writing more about this and the three aids in my next blog – so stay tuned). Likewise, if your dog moves in towards your leg, do not try to pull them away from you. All this will do is make them move in harder. To fix this situation, allow your dog to bump into your leg. Yes, that’s right. Let them bump into you. It might seem counter-intuitive, however, if you do nothing but track in a straight, unswerving direction, your dog will only bump into you for a little while before realising that this isn’t doing them any good and will desist this course of action of their own accord. It’s important to understand why your dog is doing this to you. In simple terms, you are quite literally being herded. This behavior is a test of your leadership, which is why it’s critical that your respond appropriately. By ignoring your dog and focusing on your direction, you’re demonstrating who’s the boss in this relationship. Showing this kind of leadership encourages your dog to acknowledge this hierarchy. When they do, they’ll stop bumping into you. It’s that simple. In summary, a good straight out and back is all about communicating the right signals and making sure your dog knows who the top dog really is. Does your dog recognise that you’re the top dog? Or do they think they are? As I understand there is is no fee, but will look into it further. Best regards Peter.